London is upping its game when it comes to rooftop bars and restaurants. To help you make the most of those elusive but precious rays, we’ve hopped across the capital to bring you the finest. Among them are new offerings for 2017, as well as old favourites that have woken up from hibernation, refreshed and reopened for alfresco drinking and dining. 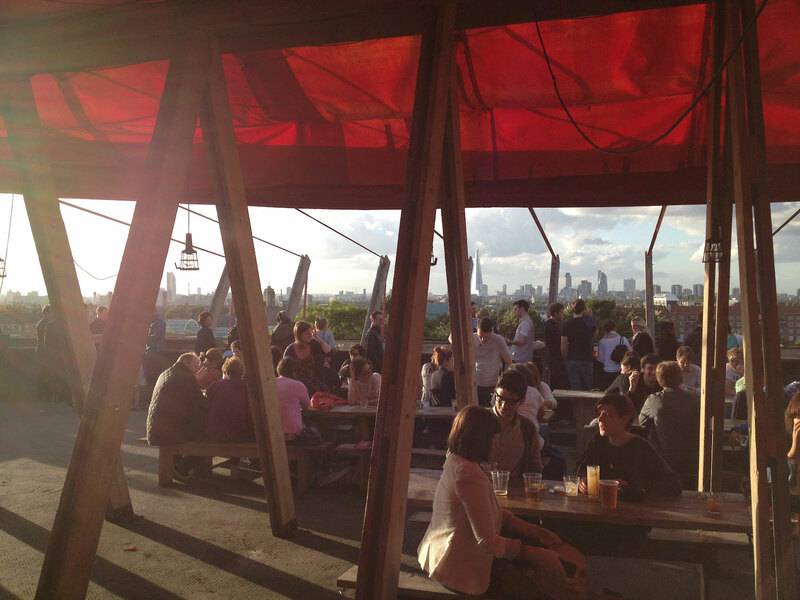 Here are our favourite rooftop bars in London. The team behind last year’s Notch bar have conjured a ‘utilitarian nature reserve’ atop a building on Oxford Street. Designers DENLDN took cues from Scandinavia for the London rooftop bar, mixing log tables with heated concrete seats and a plethora of plants. Accessed via an entrance near Marble Arch, Sisu serves up international street food and Negronis on tap. Groups of six or more can dine in the greenhouse ‘RetrEat’. The Culpeper on Commercial Street has reopened its rooftop garden for the summer, serving dishes with produce grown on site. An adjoining outdoor terrace also has seating areas, with views of the City of London. The Culpeper building, as well as the rooftop space, was designed by London studio Roberts & Treguer. Horticulturalists Urban Organic look after the garden produce. 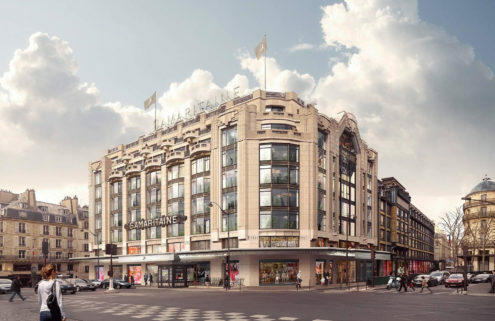 Last year’s Forest at Selfridges has morphed into the The Roof Deck Restaurant and Bar – a collaboration with restaurateur Des McDonald. It brings a dose of California to Oxford Street, replete with a boardwalk, palm trees, hanging drapes, and a cabana. The dining area has a fully retractable roof, and serves up treats like tuna ceviche and charred monkfish with scallops, and bacon. Cocktails staples include the Cucumber & Chilli Margarita and Rhubarb Bellini. 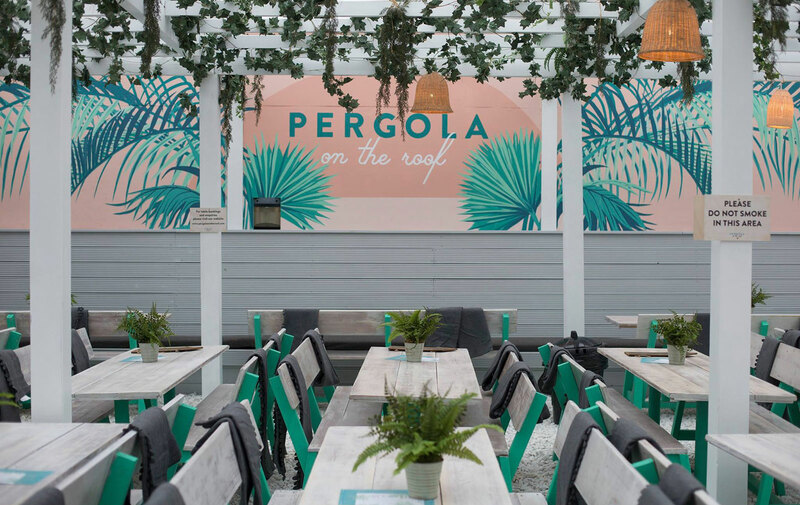 Pergola on the Roof has returned to White City for its second instalment, taking styling tips from the Hamptons. 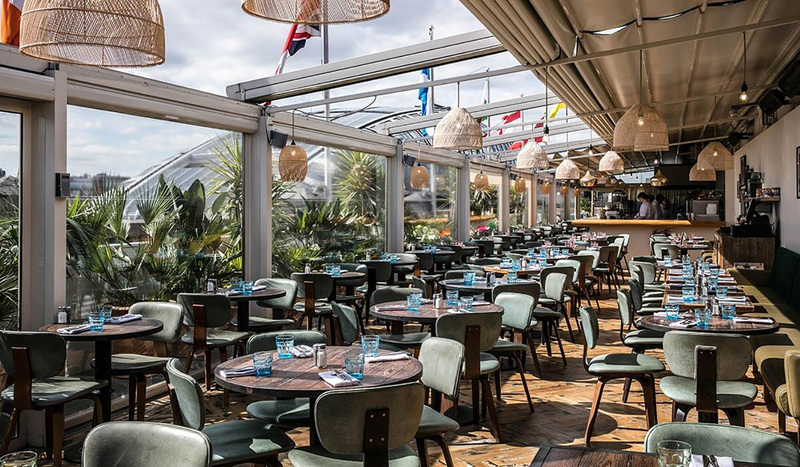 The London rooftop bar and restaurant is kitted out with white-washed wood, decking, palm trees and plenty of seafood and rosé. Food is from London favourites like Patty & Bun and 8 Hoxton Square. 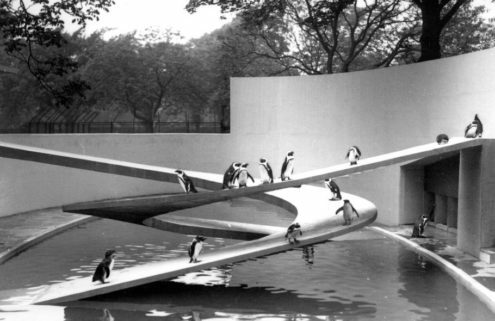 This year the Pergola team is also launching a spin-off on 24 May: Pergola Paddington Central, self-service dining, two bars set over two levels, DJs at the weekend and a ‘high line bridge’. Multi Story Car Park, Television Centre, Wood Lane, W12 7RJ. Chef Tom Aikens has commandeered the port of HMS Belfast, a former WWII ship built in 1939 by Harland and Wolff, for his latest venture. 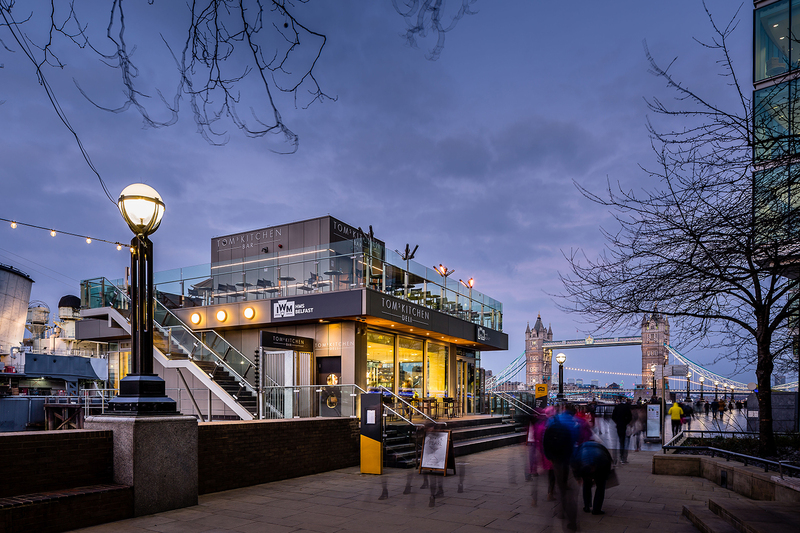 The riverside restaurant has a 58-cover rooftop bar with views of landmarks along the Thames, including Tower Bridge, City Hall and the military-grade canons of the HMS Belfast itself. 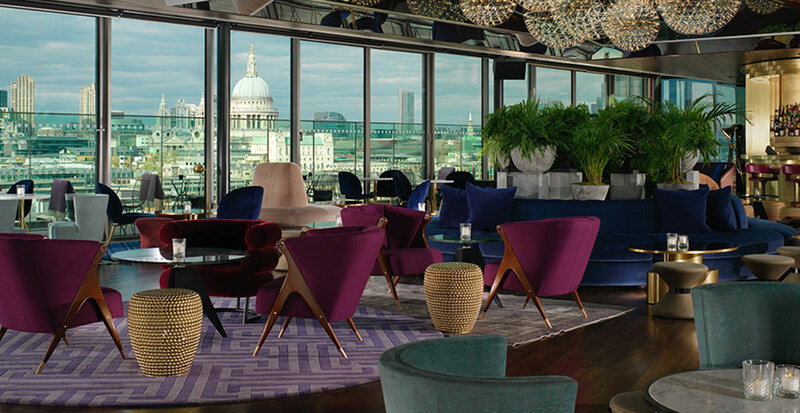 For views of the river and St Paul’s Cathedral, head to the Rumpus Room atop the Mondrian London in Sea Containers House. Designer Tom Dixon has filled its glass chamber with moody, jewel-coloured seating and brass tables. But we suggest making a beeline to the outdoor terrace to take in the scenery. DJs up the tempo from Thursday to Saturday and there’s live music on Wednesday nights. 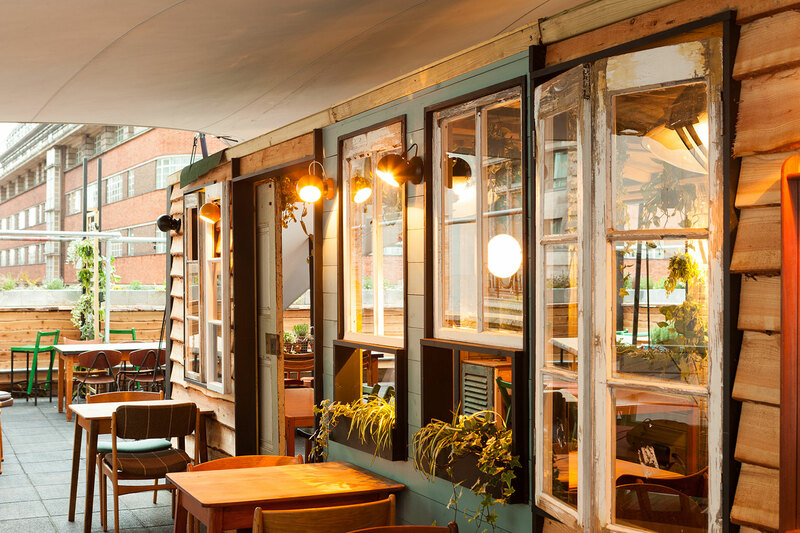 A favourite summer rooftop bar in London, Frank’s Cafe reopens on 19 May. It was originally designed by Practice Architecture for arts group Bold Tendencies, but the stylings differ year-on-year, save for the red canopy. Visitors can also check out Bold Tendencies’ summer programme of visual and performing art that takes over several floors of the building.